Umaga ng June 21 ng ideklarang signal no.1 ang Metro Manila.Pagdating ng hapon,signal no.2 na. Mukha namang OK ang panahon despite the storm signal. 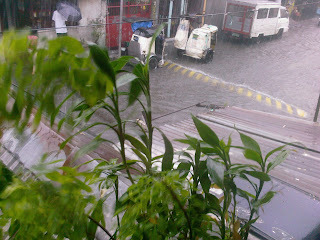 Pero pagdating ng madaling araw..heavy rain poured and the wind was blowing hard. I slept late that night. Halos kakatulog ko pa lang when I realized there was a brownout-around 4am. Nagising ako ng akala ko liliparin na ang isang bubong namin!Good thing, it was still holding on to its place..We immediately asked one of our neighbors to go up the roof and secure it.. This was around 7.30am. Kahit inaantok pa,I decided not to go back to sleep.Di rin naman ako makakatulog sa ganyang sitwasyon. Sobrang kinakabahan talaga ako pag ganyang may bagyo..Probably brought about by the trauma from the super typhoon Milenyo. Halos liparin na yung isang yero ng bubong namin noon. Fortunately alang kisame yung bahaging iyon ng bubong na iyon and I was able to hold on to it. My father and I were really wet all over. I was practically shaking from cold and fear.. I was endlessly praying the rosary by myself and was asking Him that the storm may finally stop. It was at least a 3 hour heart-pounding moment! It was only after we were able to secure it when I finally had the chance to be calm..oh, it was so traumatic..
And then there was Bagyong Frank..The traumatic feeling came back again. But my silent prayers kept me calm..Praise heavens! At talagang may current pa ang baha sa amin.. 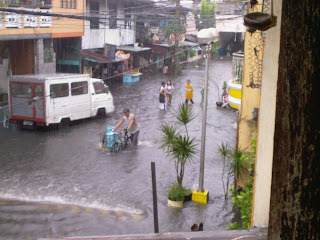 It flooded in our street( as usual ) due to unstoppable rain. In no less than an hour, hanggang tuhod na ang baha. 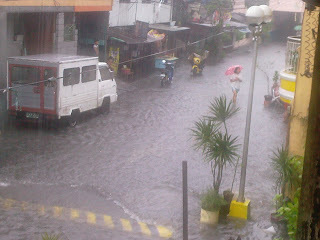 Mababa ang street namin so ang lugar namin ang tiga-salo ng baha sa other streets along 6th avenue. To make matters worst, palalim pa ang kalsada namin,so mas malalim ang baha sa kabilang dulo. At dahil mas mataas ang kalsada kesa level ng mga bahay,mas malalim ang tubig sa loob ng mga bahay. 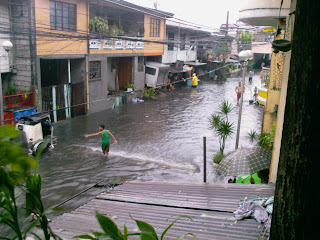 At dahil baha rin naman sa loob ng bahay, marami ang nag-enjoy na lang ng ulan sa labas.. Others had a 'swimming party'- with all the 'flood games' and drinking galore! It was 4pm already when the current went back. Dun pa lang namin nalaman ang mga balita about the casualties brought about by Typhoon Frank..Grabe, almost 80 dead (as of presstime) and the tragic sinking of MV Princess of the Stars in Romblon..Leaving 700 missing..Sad! Sulpicio Lines Inc.’s flagship vessel sank off Sibuyan Island in Romblon province on Saturday noon with most of its more than 700 passengers still missing, in the company’s worst sea disaster in a decade. The tragedy, however, is only the latest in a long line of sea accidents involving the shipping firm, underscoring the crucial need for regulating ocean traffic in an archipelago of more than 7,000 islands. In September 18, 1998, Sulpicio’s M/V Princess of the Orient, sailing from Manila to Cebu, capsized at 12:55 p.m. near Fortune Island in Batangas. Of 388 passengers on board, 150 perished. Passengers were floating at sea for more than 12 hours before rescuers were able to reach survivors. Sulpicio also owns the world’s worst peacetime shipping tragedy—when M/V Dona Paz collided with the tanker M/T Vector in 1987, killing 4,341. M/T Vector, owned by Vector Shipping, Inc., at that time was on a charter voyage for Caltex Philippines, now Chevron. Another Sulpicio vessel, M/V Dona Marilyn, sank a year later, killing around 250 passengers. In 2005, Sulpicio’s M/V Princess of the World caught fire while at sea, but no injuries were reported. According to reports from the Coast Guard, the M/V Princess of the Stars was bound from Manila to Cebu, carrying 626 passengers and 212 crew members; it capsized hours before its arrival at the port of Cebu. I was surprised with this report from ABS. Akalain mong sa dami ng mga sea tragedies na ito, most of the ships were from Sulpicio..Hmmmm..Let's pray that there will be more survivors. I guess this incident again once proved that a lot as been happening now due to global warming. We all have our share of damaging Mother Earth.. It's about time that we do our share of restoring it.